The 40th anniversary of Earth Day is April 22, and it’s the ideal opportunity to show your love for Mother Earth. Experiment with kids’ crafts using natural or recycled materials, and get artsy (while helping the planet). Make a milk carton birdfeeder for your favorite feathered friends. Wash and dry an empty milk carton, cut a large window in the front and attach a string at the top to hang from a tree. Before you fill the feeder with birdseed, add some color by decorating it with non-toxic, organic paints or nature-themed stickers. Plant an egg carton garden. Take an egg carton made of recycled paper and cut off the lid. Scoop a small amount of potting soil (and compost, if you have it) into each indentation. 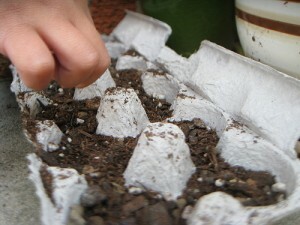 Bury a few flower or herb seeds in the soil, add water and place on a windowsill that receives direct sunlight. Create a picture-perfect natural photo frame. Go on a walk through your backyard or a woodsy area to gather fallen branches and use the sticks, twine and glue to make a beautiful, rustic frame. Trim a photo or artwork from your favorite coloring book to fit in the frame and hang in a place of honor. Give used tin cans a new life by turning them into pretty storage containers. Wash, dry and remove labels and sharp edges from tin cans of different sizes. Glue scraps of wrapping paper, fabric, wallpaper or any other colorful material to the outside of the cans and accessorize with stickers, ribbons or glitter. Use them to hold art supplies, school materials or small toys.